When a Canadian border official learned that Emily Atkin was a U.S. reporter coming to see the country's tar sands, he detained her for nearly an hour of questioning. As Atkin soon discovered, harassing environmental and science journalists remains the norm in our friendly neighbor to the north. As previously reported on io9, the Canadian government has been under investigation for its efforts to obstruct the right of the media and public to speak to government scientists. 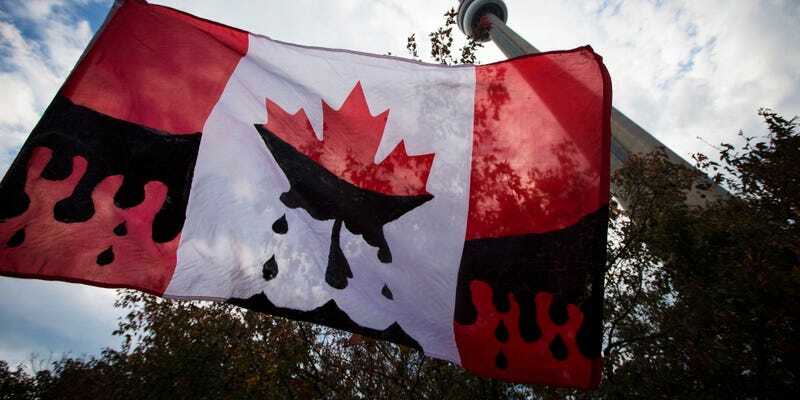 These policies are widely believed to be a part of the government's unspoken campaign to ensure that oil keeps flowing from the Athabasca tar sands — even if it's at the cost of free scientific inquiry, the environment, and by consequence, democracy itself. Writing at ThinkProgress, Atkin reports on new information that's adding fuel to the sands: a survey of Canadian journalists revealed that many environmental and climate stories about the tar sands often go unreported. The survey questioned 20 reporters with extensive experience reporting on the issue. Of the 20, 14 said stories about the tar sands were not being told, and seven of those 14 said environmental issues were the main ones untouched. According to Tom Henheffer, executive director of the non-profit Canadian Journalists for Free Expression (CJFE), the Canadian federal government has been actively working for the last decade to prevent journalists' access to information…. [When his group] released its annual Review of Free Expression in Canada Report Card, it noted two main issues at play. One, he said, is an increase in the amount of bureaucracy…to get information. The other is a gradual de-funding of research, so the information journalists want isn't even created in the first place. The CJFE's report card gave a failing grade to Canada's access-to-information (ATI) system, which saw delays beyond the legal time limit affecting almost 45 percent of information requests, and more than 80 percent of responses partially or mostly censored...."They've essentially dismantled our access to information system," [Henheffer] said. "It makes investigative journalism impossible." The bright spot in all of this, according to Ben West of the environmental group ForestEthics, is that, as the government's actions have become more public, his and other environmental advocacy organizationa have been obtaining record-breaking donations from individuals. "I actually kind of welcome these attacks from the federal government in a sense, because they are a great opportunity to highlight how crazy our government's acting, and use it as a reason to ask people for more support," he said. "Many Canadians feel strongly about this. Let the government create their own disincentives." Read Emily Atkin's entire article at ThinkProgress.